New fonts can really spice up an otherwise boring article, letter, or blog, and with so many sites online, where do you go to find the best available fonts? FontDaddy.com is here to help you find all the best fonts around, including the newer fonts and the old classics that we are all familiar with. Another great thing about this font site is that there are constantly new fonts being uploaded on a regular basis. These fonts are uploaded by various users, and even you can upload a great new font which you like and feel like sharing with other FontDaddy.com users. There really is no limit to the amount of fonts which can be found on FontDaddy.com. This website is great for all types of people, whether you are a graphic designer looking for some new fonts for any up and coming projects you have, or are a student looking to spice up a report there are plenty of fonts for you to choose from. Even business owners can find a tone of fonts to help in creating websites, banners, and logos, all of which are one hundred percent free and easily used. 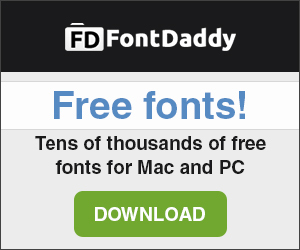 You can download free fonts on FontDaddy.com. The site is a leading resource for finding free fonts for both Mac and PC. The site has tens of thousands of free fonts you can download for both private and commercial use.